This table lists the Vedas and their extant śākhās under the Saṃhitā column. My question has to do with the śākhās. Note that the bracketed terms in the Saṃhitā column are names of the different śākhās, which are versions or recensions of the same texts. Terms in parenthesis indicate synonymous titles. What is the need for Vedas to have śākhās? Why isn't there just one true copy/branch for each of the four Vedas? Were the śākhās created by their founder sages because the Vedas were revealed to them a little differently? Do followers of each śākhā believe their version to be the true copy/revelation? If yes, does it make all Vedas of all śākhās apauruṣeyā (authorless)? Krsna Dvaipayana came to be called "Vedavyasa" for having divided the Vedas into four and then having subdivided them into 1,180 recensions. "Vyasa" literally means an "essay" or a "composition". Classifying objects is also known as "vyasa". Is the claim that Kṛṣṇa Dvaipāyana himself divide the four Vedas into various śākhās true? If yes, why did he divide them further? Q-2. why did he divide them further? Q-1. Is the claim that Kṛṣṇa Dvaipāyana himself divide the four Vedas into various śākhās true? Note: Whenever there is explicit mention of division of Samhitas into number of Shakas, number are mentioned. You may click on image to magnify; created using LibreOffice Draw; maintained IAST. Vedic mantras, or the words of the Vedas, are traditionally understood to be infinite and endless, meaning that there are an innumerable number of Vedic mantras. Some of these mantras, from the infinite set of mantras, are revealed to Rishis. Vedic mantras are of 3 types: Rk, Yajus, or Saman. The Purva Mimamsa Sutras give a definition for each type of mantra. 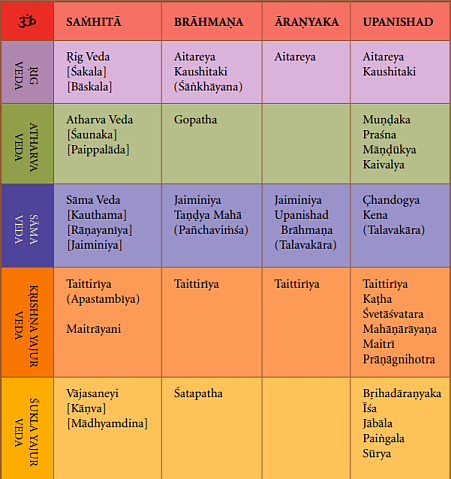 The Atharva Veda actually consists of a combination of all 3 mantra types. There is no mantra type "Atharva." Why did the one Veda split into four? So, now we've established that there are an infinite number of Rk mantras, infinite number of Yajus mantras, and an infinite number of Sama mantras, and a select number of each type of mantra are revealed to Rishis. Before Kali yuga, all the different mantras types were jumbled into one Veda, and people had to remember the entire Veda. But at the end of Dwapara Yuga, Vedavyasa put all the Rk mantras into one group, the Yajus mantras into one group, and the Saman mantras into one group. The group of Rk mantras is known as Rigveda, the group of Yajus mantras as Yajurveda, and the group of Saman mantras as Samaveda. Text 46: In this way, throughout the cycles of four ages, generation after generation of disciples — all firmly fixed in their spiritual vows — have received these Vedas by disciplic succession. At the end of each Dvāpara-yuga the Vedas are edited into separate divisions by eminent sages. Text 47: Observing that people in general were diminished in their life span, strength and intelligence by the influence of time, great sages took inspiration from the Personality of Godhead sitting within their hearts and systematically divided the Vedas.... In this form, named Kṛṣṇa Dvaipāyana Vyāsa, he divided the one Veda into four. Text 50: Śrīla Vyāsadeva separated the mantras of the Ṛg, Atharva, Yajur and Sāma Vedas into four divisions, just as one sorts out a mixed collection of jewels into piles. Thus he composed four distinct Vedic literatures. Why do different Shakhas (recensions) exist for each Veda? The reason is because Vedavyasa taught his sishyas each Veda, and each sishya further taught only a part of the Veda to his sishyas. For example, assuming I have 1000 Rk mantras, I will teach 500 of those 1000 mantras to one disciple, and the other 500 to another. Now, you have 2 Shakhas of the Rig veda, named after each Rishi or sishya who learned and propagated the recension he learned. So, a Shakha is a part of the mantras of a revealed Veda. Text 51: The most powerful and intelligent Vyāsadeva called four of his disciples, O brāhmaṇa, and entrusted to each of them one of these four saṁhitās. Texts 52-53: Śrīla Vyāsadeva taught the first saṁhitā, the Ṛg Veda, to Paila and gave this collection the name Bahvṛca. To the sage Vaiśampāyana he spoke the collection of Yajur mantras named Nigada. He taught the Sāma Veda mantras, designated as the Chandoga-saṁhitā, to Jaimini, and he spoke the Atharva Veda to his dear disciple Sumantu. Texts 54-56: After dividing his saṁhitā into two parts, the wise Paila spoke it to Indrapramiti and Bāṣkala. Bāṣkala further divided his collection into four parts, O Bhārgava, and instructed them to his disciples Bodhya, Yājñavalkya, Parāśara and Agnimitra. Indrapramiti, the self-controlled sage, taught his saṁhitā to the learned mystic Māṇḍūkeya, whose disciple Devamitra later passed down the divisions of the Ṛg Veda to Saubhari and others. Text 57: The son of Māṇḍūkeya, named Śākalya, divided his own collection into five, entrusting one subdivision each to Vātsya, Mudgala, Śālīya, Gokhalya and Śiśira. 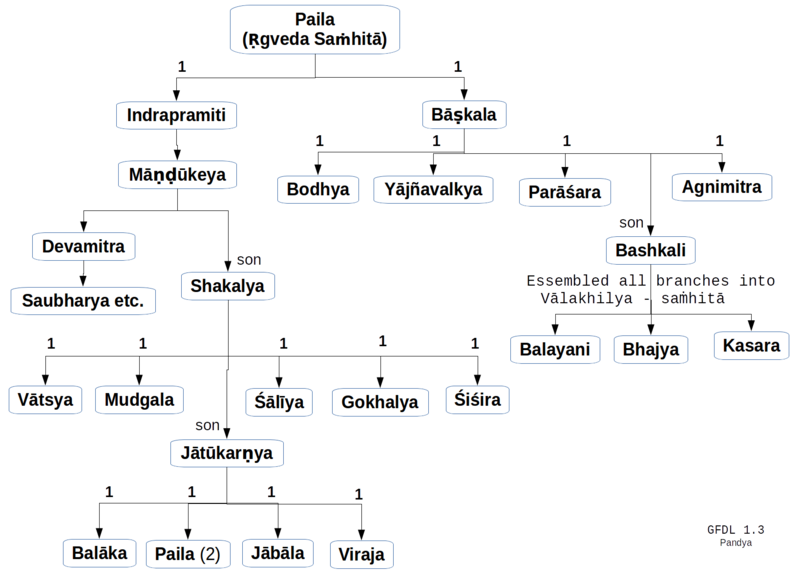 Text 59: Bāṣkali assembled the Vālakhilya-saṁhitā, a collection from all the branches of the Ṛg Veda. This collection was received by Vālāyani, Bhajya and Kāśāra. Texts 64-65: Yājñavalkya, the son of Devarāta, then vomited the mantras of the Yajur Veda and went away from there. The assembled disciples, looking greedily upon these yajur hymns, assumed the form of partridges and picked them all up. 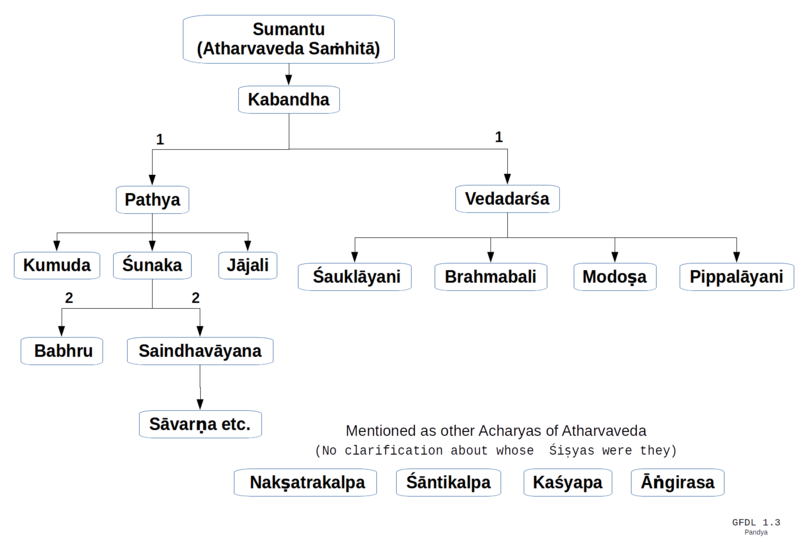 These divisions of the Yajur Veda therefore became known as the most beautiful Taittirīya-saṁhitā, the hymns collected by partridges [tittirāḥ]. Text 74: From these countless hundreds of mantras of the Yajur Veda, the powerful sage compiled fifteen new branches of Vedic literature. These became known as the Vājasaneyi-saṁhitā because they were produced from the hairs of the horse’s mane, and they were accepted in disciplic succession by the followers of Kāṇva, Mādhyandina and other ṛṣis. Text 75: Jaimini Ṛṣi, the authority of the Sāma Veda, had a son named Sumantu, and the son of Sumantu was Sutvān. The sage Jaimini spoke to each of them a different part of the Sāma-veda-saṁhitā. Texts 76-77: Sukarmā, another disciple of Jaimini, was a great scholar. He divided the mighty tree of the Sāma Veda into one thousand saṁhitās. Then, O brāhmaṇa, three disciples of Sukarmā — Hiraṇyanābha, the son of Kuśala; Pauṣyañji; and Āvantya, who was very advanced in spiritual realization — took charge of the sāma-mantras. Text 78: The five hundred disciples of Pauṣyañji and Āvantya became known as the northern singers of the Sāma Veda, and in later times some of them also became known as eastern singers. Text 1: Sūta Gosvāmī said: Sumantu Ṛṣi, the authority on the Atharva Veda, taught his saṁhitā to his disciple Kabandha, who in turn spoke it to Pathya and Vedadarśa. Text 2: Śauklāyani, Brahmabali, Modoṣa and Pippalāyani were disciples of Vedadarśa. Hear from me also the names of the disciples of Pathya. My dear brāhmaṇa, they are Kumuda, Śunaka and Jājali, all of whom knew the Atharva Veda very well. Not the answer you're looking for? Browse other questions tagged vedas history tradition vyasa recension . When Veda Vyasa divided the Vedas, didn't he write them somewhere?